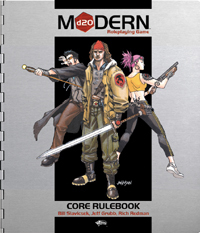 A Role Playing Game is now out d20 Modern! If you are a gamer or are looking for research material, check it out! I am working on a character sheet for a new character I plan to use soon. Jack Wylde, Codename: Tarquin. I am also working on a new character Jack Wylde for Sidewinder: Recoiled. There is a Dog House Rules Forum that discusses the game, a bunch of guys who are very helpful in learning the game. Sidewinder: Recoiled is a wild west role playing game based on the d20 Modern rules. And Jack is currently used in a game at www.PlayByWeb.com. The game is here. And I'm anxious to get playing. What is d20 Modern? The book is designed to be the sole core rulebook for all modern roleplaying game settings using the d20 system, which is the basic rules system for the Dungeons & Dragons roleplaying game. Focusing on the highly popular heroic fantasy and horror genres, this book makes the terrific d20 system accessible to roleplayers with modern tastes. The core rulebook contains everything needed to run an entire campaign, as well as four campaign models and adventure hooks to add to existing campaigns. Eventually I would like to display pages that will show the detail stats of John Steed and his partners in a d20 Modern format. If you have any details you have worked up, please contact me. ©2002 Wizards of the Coast, Inc., a division of Hasbro, Inc. All rights reserved.